As we mentioned in our last interview with Dr. Alex Lickerman, we have been fascinated with the parallels between Stoicism and Buddhism and are eager to learn more. Our guest today, Professor John Sellars, has also made similar observations by pointing out analogies between Stoicism and Zen Buddhism. But that’s only one of the numerous contributions John has made to the study of Stoicism. He is a Lecturer in Philosophy at Royal Holloway, University of London, and a Visiting Research Fellow at King’s College London. He is the author of one of the most popular academic texts on Stoicism as well as the forthcoming Hellenistic Philosophy. He is also organizing a Stoicon event in London on October 21st and you can get a ticket here. John discusses the impact of Stoicism in his own life, the Stoic ‘reality principle,’ the art of living well, and why Stoicism is like medicine for the mind. This and much more in our interview below with Professor John Sellars. Enjoy! You are the author of one of the most popular academic texts on Stoicism out there. How did you first discover the philosophy and why did it have such a strong impact on you that you dedicated so many years to studying and understanding it? I first encountered Stoicism when I studied philosophy at university. It wasn’t part of my formal course (I think there may have been an option to include it, though I didn’t take it up!). Instead I found it via a number of different tangential routes. I had read lots of Nietzsche and found his comments (both positive and negative) about Stoicism intriguing. I was studying Spinoza and found his approach to the emotions interesting. In both cases I came across studies that made connections to Stoicism. I also read a bit about political thought and came across references to Zeno’s Republic. I was curious about ancient philosophy in general, and fascinated by the figure of Socrates, but deeply disliked Plato. This led me to Epictetus, whom I’d seen described as a very Socratic philosopher who wasn’t a Platonist. All these different threads developed independently of one another, and all led me back in different ways to Stoicism. You’ve said that one of the ideas that you admire about Stoicism is its ‘reality principle.’ Can you elaborate and why is this a key component of the philosophy? Some of the least attractive character traits I can think of are arrogance and self-importance, and some of the most underrated virtues are modesty and patience. For what it’s worth, I think we’d all be better off if people were in less of a rush and didn’t take themselves and everything they do quite so seriously. In the long run, we are all dead, and many of the things that can eat people up inside are of little or no consequence. This is a central theme in Stoicism, whether we think about the ‘view from above’ or what Seneca has to say about the shortness of life. We see it throughout Marcus’s Meditations, and it’s in the background of Epictetus’s distinction between what is and is not up to us. Part of developing from an egotistical small child or a self-centred teenager into a well-balanced rational adult involves acknowledging and accepting the limits of our power and self-importance. We are not, it turns out, the centre of the universe. Much of what happens during the course of our lives is out of our control. Yet there’s a common implicit culture in the West that tries to say that if people are not fabulously rich and successful, then it is in some way their own fault for not working hard enough. This strikes me as both false and psychologically damaging for many people. Reflecting on my own life, I would say that much of what is really important in it has been out of my control. I did not choose to fall in love with my wife and had no control over whether she would fall in love with me. We are blessed with a healthy son, but it could so easily have been otherwise. I have been fortunate with good physical health, and although I try to look after myself I’m all too conscious that I have no say over whether I might develop a serious medical condition. Over the years I have applied for many jobs, but never had any control over which have been offered to me. Studying Stoicism has helped me both to understand the limits of my own control over these things and to acknowledge the good fortune that I’ve had. Without being morbid, all this could be taken away at any moment, so it is important to appreciate what one has, and to enjoy it, right now in the present moment. Of course, sometimes this is easier said than done! It’s perhaps harder to say why this is a key component of Stoicism. In part, it reflects the idea that we all just parts of a larger whole, Nature. It also draws on the idea (that the Stoics took up from Heraclitus) that everything is in a continual process of change. And it’s obviously closely connected with the ethical idea that we ought to attend above all else to our inner character, and place less value on external objects and situations. How do you use Stoicism in your day-to-day life? Can you talk to us about something difficult you went through or something you struggled with and how your knowledge of Stoicism might have helped? That’s a complex question, and one that I’ve tended to avoid talking about in public. I’ve already said a bit about how Stoicism has helped to shape how I appreciate the most important things in my life. At that very general level I think it probably has contributed to my overall outlook on things. Here I’m very much thinking of the writings of the Roman Stoics rather than the fine details of the philosophical system. Following on from the previous question, I think the most valuable ‘take away’ thing is the constant reminder to put immediate concerns into a much broader context and remind oneself what is of most value. That is then closely connected to the question of what is and is not within one’s control. Within my own life, both personally and in my job as an academic, writing is really important. I enjoy both the process and seeing the final product. Whether anyone else reads it or likes it is another matter, and as an academic author I rarely have to think about sales figures in the way someone trying to make a living as a writer might do. The process of writing is entirely within my control. Because I enjoy it, I don’t suffer from procrastination, but I do suffer from the usual distractions and competing demands on my time. Both Marcus Aurelius and Seneca are good for reminding me to keep my focus on what matters to me most. So, at that day-to-day level, I do think Stoicism can help, or at least that it helps me. But there have also been limits to how much it has helped me. A while ago now I went through a difficult period and – interestingly – I found Stoicism of no help at all. In part that may have been because Stoicism had become part of my ‘work’, and excessive work was part of the problem. It also seemed to offer a very intellectual response, and, if anything, I needed a break from thinking! So, during that difficult period I turned elsewhere for help, drawing on a longstanding interest in Zen Buddhism. The answer for me at that particular point in time was sitting still, doing nothing. What’s a frustration you have with the philosophy that if you could go back in time and speak to a Marcus or a Cato, you might argue with them about? I’ve never had any kind of religious belief and find the whole idea of a creator god or a providential order to Nature completely incomprehensible. Marcus is suitably agnostic at various points, but Epictetus’s regular references to God do grate with me sometimes. They are all the more frustrating given that in many contexts they could simply be replaced by a reference to Nature. You’ve written that Stoicism’s art of living is similar to the Japanese art of archery, as described in Eugen Herrigel’s Zen in the Art of Archery. We are always looking to understand the parallels between Stoicism and different Eastern practices. Can you expand on the common themes between the two? I mentioned earlier that I turned to Zen during a difficult period. One of the books I found most helpful then was another book by Herrigel, called The Method of Zen. A little later I got around to reading his more famous Zen in the Art of Archery and was struck by the parallel between what he has to say and the Stoic Antipater’s use of an analogy with archery. Both suggest that the key to being a good practitioner is to focus on the act (which is within one’s control) rather than the outcome (which isn’t). Herrigel says that the good archer is one who shoots well, which isn’t necessarily the same as always hitting the target. He also says that the goal ought to be to shoot well, not hitting the target, although paradoxically this may in fact lead to one hitting the target more often. Antipater says something quite similar, especially about shifting the definition of the goal from an external outcome to an internal action. I don’t think there’s much possibility of influence here, so it looks like an example of the two traditions reaching the same idea independently. There’s a separate question about how accurate Herrigel’s account of Japanese practice is, but I’m not qualified to assess that. You are the author of The Art of Living: the Stoics on the Nature and Function of Philosophy. How would you summarize the Stoic “art of living” to someone who is just discovering the philosophy? 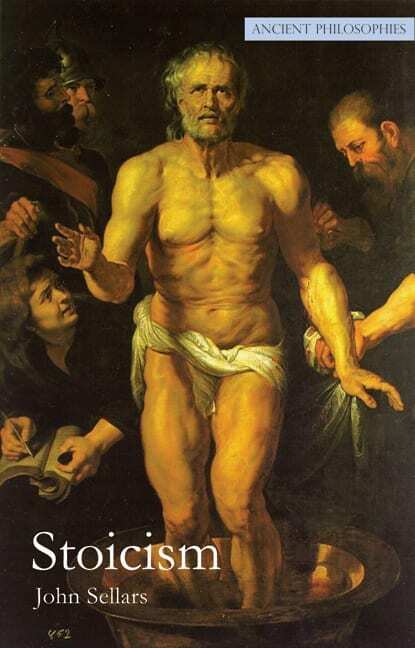 For the Stoics philosophy is an art or craft analogous to medicine. Like medicine it involves a body of complex ideas but, also like medicine, the point of learning those complex ideas is in order to achieve a very practical outcome. That outcome, again like medicine, is therapeutic, but it is therapy for the mind rather than the body. In this sense Stoicism, like a number of other ancient philosophies, has a very practical outlook, unlike the popular image of the modern academic philosopher, sitting in an armchair thinking about obscure technical problems of little interest to anyone else. The Roman Stoics in particular offer rationally-grounded advice about how to live well. These days people might turn to religion or Eastern philosophies for that kind of guidance, but it has always been a central part of the Western philosophical tradition as well.